Oak trees are significant for a number of reasons not the least of which is the fact that it is the Illinois state tree. It is also a tree that factors heavily into the ecosystem as 500 living species rely on it for survival. Openlands was founded in 1963 as a program of the Welfare Council of Metropolitan Chicago. 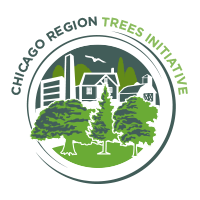 It is one of the oldest metropolitan conservation organizations in the nation and the only group with a regional scope in the greater Chicago region. According to Jerry Adelman, Openlands was one of the first conservation groups to be based in a metropolitan city. Adelman said, Openlands works in different scales in the city of Chicago with community partners for tree planting, community garden, and the greening of school campuses. Throughout the region we’ve been thinking comprehensively about connections for our trails and greenways that cut through many jurisdictions. As a not-for-profit we can convene people and get them to partner up and work collaboratively. Saturday’s workday brought an undeterred group of about 20 people to plant trees and mulching the base of existing trees. For more information about “Oaktober” Oak Awareness Month visit chicagorti.org.